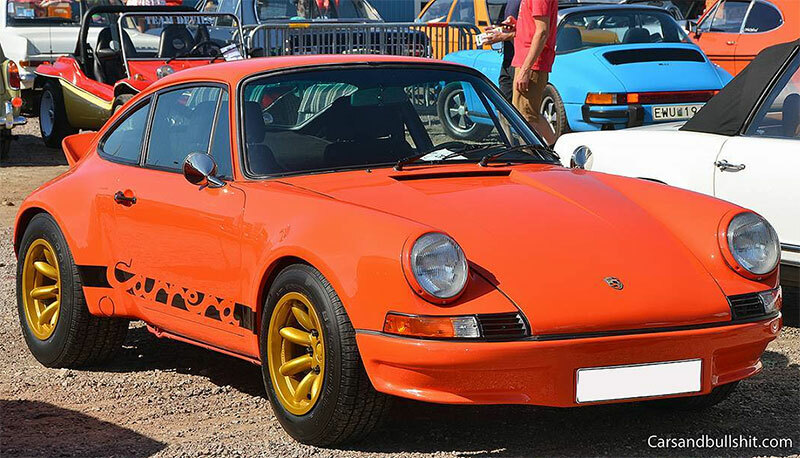 Yes, this orange stunning car definitely draws people’s attention at the classic car show at Mantorp last year. It’s a gorgeous car. With very brutal design. The ducktail and the Carrera striping in combination with the dope body kit and brutal wheels makes it hard to believe that this actually is a Porsche 911T from 1969. A car launched in 1967 that replaced the 912 and introduced as the new entry level Porsche. The 911T is not a powerhouse, but the little two liter engine with its puny 110 horsepower has both the right sound and character. And it’s faster than you might think. Bear in mind that the little car only weighs 1070 kilo, the car accelerates from 0-60 in just 8,3 seconds (according to 356-911.com). This is impressive, and flat out it will do 124 mph (199,5 km/h). Pretty nice, right? From a distance this car looks like half a million. And many visitors flocked around it, admiring it with eyes big as dinner plates. This car is definitely an eye catcher! The Swedish Porsche Carrera Cup Scandinavia is a very popular championship. It has got a lot of cars on the grid and this year several new drivers join the grid. Lars-Bertil Rantzow is no stranger to racing. 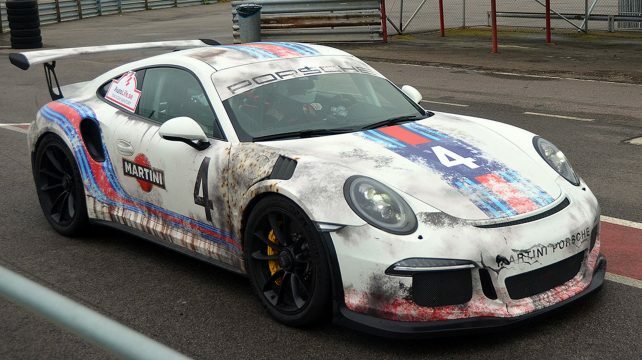 He has driven Porsche´s for years and makes a comeback this year. Great news for the series. Well, this is the second post in a row on cars made by Saab. This is one of their absolute most anticipated cars, a car that many customers really wanted Saab to build. 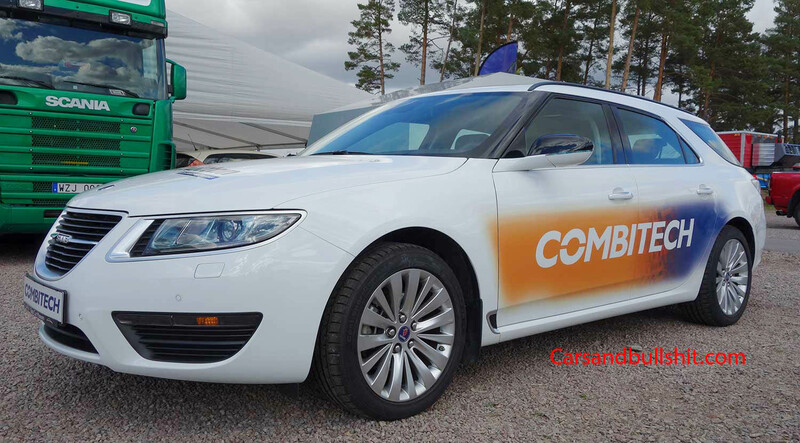 Behold the Saab 9-5 Sportcombi. A station wagon (or in Swedish: a combi) with a lot of room. The last model Saab ever built before going bust in 2012. The 9-5 was a beautiful car, and the SportCombi in Arctic White pictured here did not disappoint. I took theses photos at Mantorp Park racetrack at a trackday. This car is a Saab 9-5 SportCombi TTiD4 XWD Vector with 190hp. 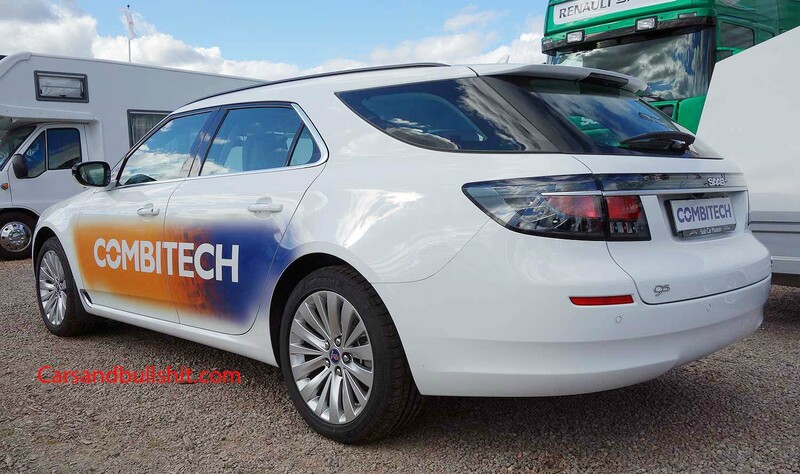 It is owned by Combitech and resides at The Saab Museum in Trollhättan. At the trackday, it sure did draw a lot of attention. Actually, several persons I spoke to really wanted this car. They absolutely loved it. It’s a shame really, that Saab only builds 27 of this very nice model. It definitely deserved better. The Saab 9-5 SportCombi has the Saab quality, Swedish design, top notch safety and very nice engines under the bonnet. But, unfortunately they are rare as they come. The Saab 9-5 SportCombi is now a collector’s item, and is rarely seen in the classifieds. The 9-5 SportCombi came with several engines. You could choose between diesel, ethanol and petrol. The most potent version had a 2.8 liter V6 turbo, delivering 300 horsepower. The two-liter turbocharged inline-four with 220 horsepower seems to be the clever choice for most people. All 9-5 had Saab´s XWD all-wheel drive as standard. It is a big car, 501 centimeters in length. The cabin is light, with wonderful seats, several nice features and it’s perfect for long journeys. The cargo space swallows 56 cubic feet of luggage with the back seats folded. The top of the line model had the 2,8 liter turbocharged V6. The 300 horsepower power plant combined with Saab´s XWD was effective. It did the sprint 0-60 in 6,9 seconds and had a top speed of 250 km/h (155 mph). The 2.0T BioPower with 220 horsepower was no slouch either with 7,9 seconds 0-60 and a top speed of 240 km/h (150 mph). The car in these pictures has 190 hp (142 kW; 193 PS) at 4000 rpm. It scores 400 Nn of torque at 1750 rpm, accelerates from 0-60 in 8.8 seconds and can do 230 km/h (140 mph) flat out. Remember these were big cars weighing almost 2100 kilos. Want to see one? Well then you can visit Saab Car Museum in Trollhättan, Sweden. There are many interesting Saab´s in stunning condition to admire, if you care to visit. The cars will be TCR-cars, and hopefully it will be more cars on the grid than before. Last year was not the finest moment in Swedish racing history. Don’t get me wrong, the racing was great, the drivers phenomenal, and we have some great tracks here. But we need larger grids, and cheaper cars that do not cost an arm and a leg to run. Last year there were way too few cars competing. At Falkenberg racetrack I watched a race with just five cars finishing (ok there was some carnage, but what the heck). That has got to change; otherwise the audience will stay at home. The former STCC cars were extremely expensive, it’s very important that the new cars will be cheaper to run and maintain. If there are less cars racing next year, the sport will lose its attraction to many fans. Fortunately the former STCC-cars will race in the GT-series. In May, I visited the Mantorp Park circuit at a sports car event and watched the testing of the new Seat Leon TCR-car. Man, it did sound awesome. And it seems to behave very well on the soaked track. I was actually surprised by the performance and sound, it did look fast and I imagined in my mind a starting grid with a bunch of other cars like it. That would be great to watch. 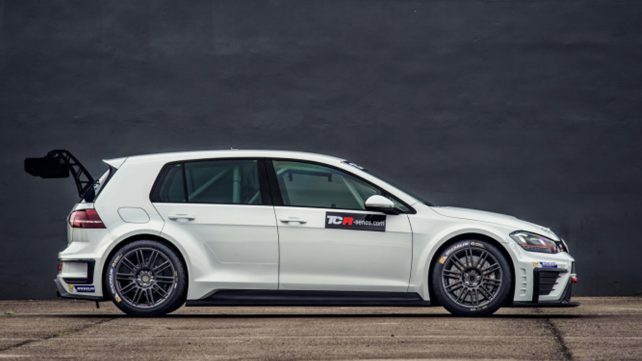 This is the new Volkswagen Golf TCR, a car that will be driven by at least two teams in the STCC next year. Photo: Lestrup Racing Team. When im writing this, only five teams are presented for 2017. That is alarmingly few. However, STCC driver Markus Annervi just signed on to run a Honda Civic TCR, and Greger Petersson, head at Sportpromotion just said to STCC.se that he has two more JAS-built Honda Civics available for other drivers to rent. PWR Racing Team will run at least two Seat Leon cars. LMS Racing will enter with the Audi RS3 TCR, and Fredrik Lestrup at Lestrup Racing Team and Experion Racing Team will race join the others in the very popular VW Golf TCR. It sure will be exciting to see how many cars will be joining the grid on Ring Knutstorp the fourth of May. Hopefully the grid will hold at least 12 cars, that would be great. More info as always on STCC.SE.